Antlers are beginning to drop and it’s time to hit the woods and make sure your mineral sites are freshened up, or if you don’t use mineral (yet) new sites are established. Providing high quality minerals to your deer herd is extremely important not only to maximize antler growth, but also for improved overall health, disease prevention, improved milk production and a healthy deer herd on your property. Minerals work together like spokes on the wheel of a bicycle tire. If a spoke gets “out of whack” the tire wobbles. A good example is the way Calcium and Phosphorus interact. 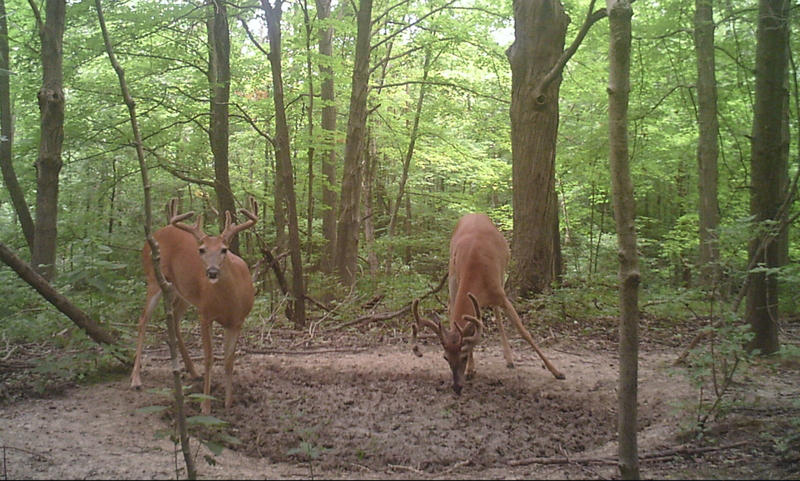 Before any Calcium can be transformed into antler growth or bone development, enough Phosphorus needs to be present in a deer’s diet AND before these two can interact, enough VITAMIN D has to be present in the deer’s diet. Today, there are many “deer minerals” on the market that have a high level of salt and perhaps a significant level of calcium but low or virtually no PHOSPHORUS or other major minerals, trace minerals or vitamins. Calcium and salt are very inexpensive whereas PHOSPHORUS and other major minerals, chelated trace minerals and vitamins are the most expensive elements in a bag of mineral. Look for a balanced deer mineral that has been SPECIFICALLY DESIGNED for deer and elk. It should contain no more than 50% salt, Phosphorus, as well as other major minerals such as Sulfur, Magnesium, Potassium and all trace minerals including Zinc, Copper, Selenium, and Vitamins A, D, and E.
Just mixing some Di-calcium Phosphate, Calcium Carbonate, and trace mineral salt together, certainly is not the answer to a complete mineral that will benefit deer by increasing herd health or promoting antler growth. Much of the Calcium and Phosphorus in a deer’s body is stored within the skeletal system. If a deer has a deficiency of either Calcium or Phosphorus, they will take the mineral they need from their skeletal system (bones) and a long term deficiency of these minerals will cause bones to weaken and even break. 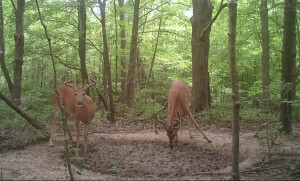 Bucks have a huge demand for Phosphorus and Calcium prior to and during the antler growth period and does also have a huge demand for these major minerals when they are producing milk for their fawns. Copper is very important for normal growth and body/skeletal development. Several years back, there was some research done that also indicated that a Copper deficiency may cause Chronic Wasting Disease (CWD). The source of Copper is also very important as Copper Sulfate or Organic Copper (chelated as we use in our TROPHY DEER MINERAL) are the MOST highly digestible forms of Copper whereas Copper Oxide is very poorly absorbed. Manganese (not to be confused with Magnesium) is another trace mineral that is required for normal reproduction and fetal development. Selenium is important for reproduction and also works with vitamin E to help deer deal with stress, and also important in antler growth. Zinc is important as it stimulates an animal’s immune system, helps deer deal with stressful periods like the rut, cold, snow and a drought. Antler King’s TROPHY DEER MINERAL contains ALL Major Minerals, Trace Minerals, Vitamins, Amino Acids AND a specially designed Yeast Culture that helps deer stimulate their digestive system so that everything that they eat will become more available for body growth and antler growth. When refreshing your current sites or starting new ones, make sure you are using a complete mineral supplement, like Trophy Deer Mineral, Apple Burst Mineral or Power Rack that will provide your deer the necessary minerals, vitamins and nutrients for improved health, disease prevention and increased antler growth. Thanks again for choosing Antler King Trophy Products, Inc. we appreciate your business and will continue to work hard to provide you the highest quality products available to Grow, Attract and Keep deer on your property.